The harp makes such celestial sounds, it's no wonder artists often portray it as the instrument of angels. It can soothe tensions and calm nerves as the harpist's fingers glide gracefully across the strings. 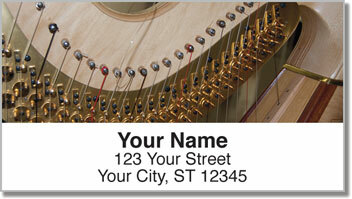 Our original return address labels feature close-up photography of this amazing music-maker! They'll make a uniquely elegant finishing touch for all your outgoing mail. 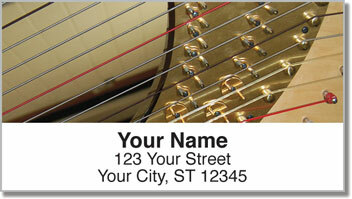 Just like the peaceful songs of a harp, these address labels will make life a little easier to bear. 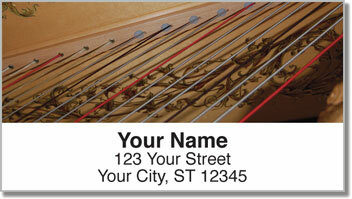 No more scribbling your name and address on envelopes! Just peel and place thanks to a handy, self-adhesive backing. 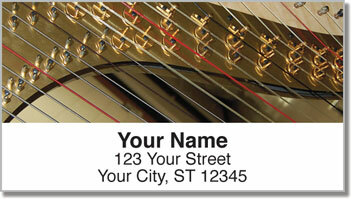 Order your very own Heavenly Harp Address Labels today! Get them with matching personal checks.